Recently I shared some information about the relationship between early language skills and literacy skills development in young children. The research is very clear: children with strong early language skills tend to have higher literacy skills later on. Specifically researchers Hart & Risley found the quantity of words spoken to a child in the first three years of life were strongly associated with a child’s language skills, vocabulary size and IQ later in life. So we know how very important those early language skills are, even before age three! But what about those preschool years? How can we help build literacy and language skills before we send our kids off to kindergarten and beyond? 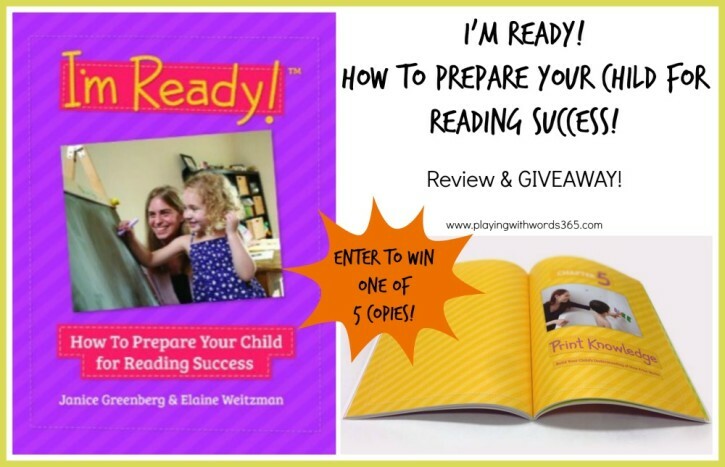 Today, I am going to share with you a new book, I’m Ready!™ How to Prepare Your Child for Reading Success which can help parents (and professionals!) build early literacy and language skills in young children. Disclosure: I was provided this book by the lovely people at The Hanen Centre in exchange for my honest review. As usual, all opinions are mine and are not influenced by the free product. In addition, there are Amazon Affiliate links for your convenience. When you order through my Amazon links I earn a small commission at no cost to you that helps fund the upkeep of this website and fuels my coffee addiction. Thank you! I’m Ready!™ How to Prepare Your Child for Reading Success was written by Janice Greenberg, B.Sc., D.S.P & Elaine Weitzman, M.Ed. both speech-language pathologists from The Hanen Centre. This compact book (just 75 pages including references) is jam-packed with tons of research-based practical ideas, checklists, and and easy-to-use tips and strategies to build early literacy skills in young children. Parents, caregivers and other early childhood educators will love using these strategies to embed literacy-learning within everyday activities and routines. Parents of young children with special needs who are in the pre-literacy phase of development regardless of chronological age. OOhhh pretty colors! Love the bright colors and beautiful designs. The book is very aesthetically pleasing! Pretty colors and designs throughout make this book a pleasure to read. Pictures! REAL PICTURES! This book is FULL of pictures of real parents interacting with their children. This helps the reader really relate to the content of the book. The book is nice and SHORT. Only around 67 pages of content makes this book less daunting to parents and professionals who want to learn strategies to implement NOW with young children than some other resources out there. Researched based information! I love research based information! I immediately noticed notes on current research weaved into the book in an easy to read format: this book is written in plain English. 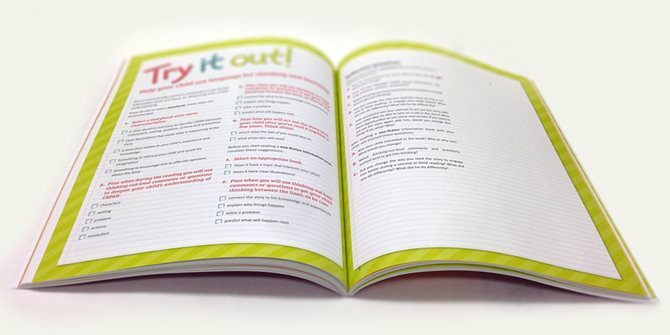 Then within each chapter, there is a “Try it Out” page that provides some review and refection questions to help you apply these strategies in your day. The wonderful people at The Hanen Centre are providing my readers with a downloadable “sneak peak” of sorts from I’m Ready! so you can see for yourself what a cool resource this is. They are sharing an excerpt from Chapter Three: Vocabulary-Make New Words Sparkle. In this chapter, they introduce a mnemonic SSTaRS that can help you build you child’s vocabulary. It is fantastic! Click below for your freebie! You can also get an additional sneak peak on Hanen’s website. RESEARCHED BASED! This book is based on research, which is so very important. (And the research used is all listed at the end of the book in the FIVE + pages of references at the end of the book). Where Can You Pick up a Copy? You can order a copy on Amazon or on Hanen’s website. Now for the AWESOME part. The wonderful people from The Hanen Centre are going to give away copies of this fantastic resource to FIVE of my readers! That is right! F I V E!!! Entering is SIMPLE. Just leave a blog comment below and tell us this: What is your favorite activity to do with your young child(ren) to encourage early literacy development? Then enter your information in the Rafflecopter below! Want to increase your odds of winning? You can “like” The Hanen Centre’s Facebook page and/or PWW365’s Facebook page for additional entries! This sweepstakes is open worldwide to those 18 years and older. Entries will be accepted until 11:59 pm US Pacific time on Tuesday June 3rd, 2014. 5 winners will be selected via the Rafflecopter widget. Winners will be notified via email within 5 business days of the close of the sweepstakes. Winners have 48 hours to claim their prize. The Hanen Centre will mail out all prizes. NO PURCHASE NECESSARY TO ENTER OR WIN. A PURCHASE DOES NOT IMPROVE YOUR CHANCES OF WINNING. VOID WHERE PROHIBITED BY LAW. Please read FULL rules before entering in the Rafflecopter Widget. I think the best way to encourage early literacy development is to…..READ to the child 🙂 I like to make the majority of my therapy session activities based on a book appropriate to the child’s reading level. Then we will work with the vocabulary, words, rhyming, letters, etc. depending on where the child is in his/her development. I tried to leave a blog above but it wouldn’t let me. Our favorite games in the car is “I Spy with My Little Eye”. The kids love it. My son and I read a lot. We love to go to the library and pick out books together. We go to story-time at the local libraries. We also use lots of learning booklets to work on our numbers and letters. He loves to learn and is so smart. It’s so exciting to see him recognize letters and numbers. My preK speech and language kiddos and I begin every session with a story. All of my speech/language sessions focus on a different book “theme” each week. My kids are introduced to vocab and concepts from the story at the beginning of the week and if I see them again later in the week, we try to hit these points again. I send home weekly updates to the parents about how they can increase carryover and talk to their child about our story/theme of the week. Books provide great therapy materials and are the best lesson plan resources for young kids!! My favorite pre-literacy activity to do is rhyme, rhyme, rhyme all the time! We read rhyming books, makeup silly songs while we work, and pretty soon they are filling in those silly words themselves. I love to encourage literacy with my children by talking about the various signs we see while driving. With having one child active in sports, we are constantly driving around to various events. Since we are in the car, I take the opportunity to talk with my kids about the signs we see. We sometimes even play I spy with letters and letter sounds. I love reading to the kiddies. In my therapy sessions I like to show parents that ‘reading’ a book isn’t just about reading the print, that they can use it to make up their own stories and rhymes and books are an endless resourse for working on all phonological awareness skills: syllables,sound identification, rhyme, alliteration and attention! I like to share a simple book with repetitive phrases and make the book interactive. I have been using dialogic reading, which is basically a form of building on concepts through conversation while reading. I do many things to support early literacy development. I read lots of books. We look at pictures and make up our own stories. We use simple books to encourage our child to “read.” We do rhyme time, play with sounds, and poems to name a few of our favorite home activities. We visit story times at book store, libraries and some of our favorite state parks too. Wow, I’m so excited for this new book! I love Hanen and literacy, what a great combination! My son is only 2, but we love reading books! Every day before nap and bedtime we read 3-5 books (of his choosing). Last night he “read” along with me to one of his favorites. Read alouds 🙂 This is very helpful for me to introduced new words and do articulation at the same time, especially for students who has autism specturm disorders. The students really engaged in the picture books and like to do story retell. Interaction–lift the flaps, do the movements, sing, use repetitive phrases–even if you add your own, use objects from the story, picture books with no words, flannel boards for matching, letting the child lead,…. We play the “letter basket” game. We have a letter/sound for the week, and then we go around the house and gather items that begin with that letter and pop them in our basket. Each day we look at what we have in the basket, and try to find more pictures/objects to add to the basket. Also – when we are out, we look for and name anything that begins with our chosen letter. I like to do activities that relate to the book. So in Harold and the Purple Crayon, after we read, we might color with a purple crayon! Etc. That way the books take on new and relatable meaning! Hands down, the best thing I do is to have a well established book time! Same time and same routine everyday. Within that routine we add novelty! Great way to practice concepts of print, rhyme, vocabulary, and alphabet knowledge. I build in elements of surprise and use many different strategies. I absolutely love choosing a book, reading it over multiple days with my students, and doing activities with the same theme. I also try and relate a phonological awareness (alliteration or rhyming) activity with it as well! Thanks for the giveaway opportunity! My son and I always do phonemic awareness activities when he’s in the tub. Sometimes we do rhyming words (real and nonsense), sometimes we do segmentation of CVC words. He LOVES it! I love using felt boards to sequence read alouds. We read books that have something to do with what we did that day/week. For example, we went to the zoo and saw the new tigers. For the rest of the week we have been reading about tigers and playing with tiger toys. I also have started to put index cards with word on things like – door, table, toy table, bookshelf. I did this with a two -three year old preschool class I taught a million years ago and the kids started to recognize the words when I showed them cards with words that were not on the items. I was amazed. I love using books to target vocabulary and finding words that start with certain sounds. Right now my favorites for summer are Beach Day (amazing pictures for vocabulary), Camping Spree with Mr. Magee and When A Dragon Moves In. We also play hide and seek sight words with my son who is 5! Makes practice less tedious and boring. Reading books is my favorite activity! There’s so many activities you can do afterwards! Constant dialogue. Narrate what you are doing. I love letting young children “read” to me and see what kind of creative stories they can come up with from the pictures! I read to my son and to my students constantly. Not only do I read, but we talk about the pictures, I ask questions about the story and/or pictures and try to engage the children as much as possible. Reading and talking about books and letting them “read” to me too. I love using the app Goodnight ABC. There are interactive pages and coloring pages. I use this app to help promote literacy with some of my DD pre-k kiddos where we work letter sounds, recognizing letters, naming things with certain beginning letters, finding objects based on descriptions, etc. With my young son, we of course read together, but I like to provide books for him to access and “read” on his own, such as in the car and mixed in with his other toys. I love peeking back at him as he rides in the car and seeing him totally absorbed in a book! He has started to try to read us his bedtime stories as well, wanting full control of the book! I work with 2-4 year olds, in the clinic and in the home. I love prepping a book each month. A good story with a beginning, middle and end. I buy the characters and objects pictured in the book and build a good portion of my therapy time reading the book and playing with the objects. Not only can I cover the goals for each child, I can also teach some book literacy skills, such as looking at the pictures, reading left to right, expose them to the words and letters on the page. If they are old enough, we spend some time on beginning letters and sentence construction. Love the variety each book brings and the concepts/vocabulary and conservation they bring. I love to activate prior knowledge in my three little ones by exploring the front and back cover, title page, spine, and pictures of books. I encourage them to talk about what they already know, what they notice and read books to add to what they already know! With the hyperlexic kiddos I see I love playing with letters by hiding them in sand and putting them in trucks. Making the letters run, jump and fly. My favorite activity for the older kiddos is throwing bean bags, hopping on sounds and letters. I love to incorporate movement and crafts.